With all the advances and conveniences that iOS offers, there’s one place that OS X continues to trump Apple’s mobile platform: automation. But with the appearance of IFTTT for iPhone, that gap is perhaps narrower than it once was. If you’re not familiar with its Web service, IFTTT stands for If This Then That. Even those not intimately familiar with programming should get the basic idea here: If a pre-determined condition is met, then an action is taken. On the Web, IFTTT integrates with a number of popular services (which it dubs “channels”), including Twitter, RSS, Google Talk, Evernote, Pocket, and more. IFTTT's home screen is a running activity stream of recipes you've created and other actions. IFTTT’s app is, unsurprisingly, more limited than its Web service, but it does bring access to new channels by integrating with three services available on your iPhone: your contacts, your reminders, and your device’s photos. That way you can, for example, set up a recipe that automatically uploads your iPhone’s pictures to Flickr. While the integration with your phone’s own data is somewhat limited, the other services that IFTTT offers on the iPhone are extensive—I counted several dozen. Each channel has a variety of options assigned to it, depending on whether it’s the trigger or the action. You can create workflows, or “recipes” in IFTTT parlance, which can then be shared with others. Generally, you need to activate channels, either by entering your credentials for that service, or—on with phone-specific data—by allowing access to that particular information. Each channel comes with a variety of possible triggers and/or actions. When you first launch IFTTT, it’ll run you through a quick explanation of the service and what it does, then dump you out into the main screen. The centerpiece of that screen is a sort of timeline chronicling actions you’ve taken: recipes you’ve created, channels you’ve activated, workflows that have been triggered, and so on. To create a new recipe, you tap the mortar-and-pestle recipe icon in the top right. That slides the screen over and provides a sidebar where you can choose to create new recipes, activate or deactivate any recipes you’ve already created, or browse the available shared recipes by tapping the glasses icon in the top right. 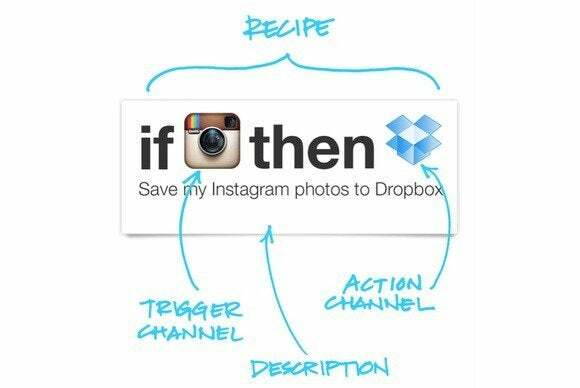 Creating a new recipe is simple: IFTTT walks you through it step-by-step, having you choose the trigger from a scrolling list of channels, and then the action. Each recipe can be checked, to make sure it’s working, and you can opt to have it trigger a push notification when the recipe is actually completed. Many recipes also have advanced options if you want to tweak the details—for example, if you want to upload pictures you take with your iPhone to Flickr, you can choose to only have those added to a specific album get uploaded, and how those photos will be tagged. Many recipes allow you to tweak their options so that they more fit your needs. As a test, I created a few recipes, including one that automatically uploads screenshots from my phone to a Dropbox folder—a handy workflow when you frequently write about iOS apps. While the recipe worked well enough, the major drawback with IFTTT on the iPhone is iOS’s restrictions on background apps in iOS 6 and prior: By default, your recipes only trigger when IFTTT is in the foreground, thus losing out on some of the “automated” aspects.